What are the Best Products for Getting Rid of Red Mite? It's that time of year once again, where the sun comes out, the birds sing in the trees and the tiny vampires known as red mite appear as if by magic, to plague the chicken keepers of Great Britain. This perennial pest strikes everyone eventually, regardless of if their coop is timber, plastic or metal and so the Flyte so Fancy chicken blog has dragged its attention away from the ducklings wending their way back and forth across the pond and looks instead at the best products for getting rid of red mite. Preventing red mite taking a hold in your coop is, of course, always better than trying to cure an infestation. It involves a little elbow grease and working within a weekly routine of cleaning. There are a few great products available for the weekly clean that will help keep your chicken coop mite free inside. Poultry Shield and Diatom when used in conjunction are a very effective way of keeping red mite at bay. 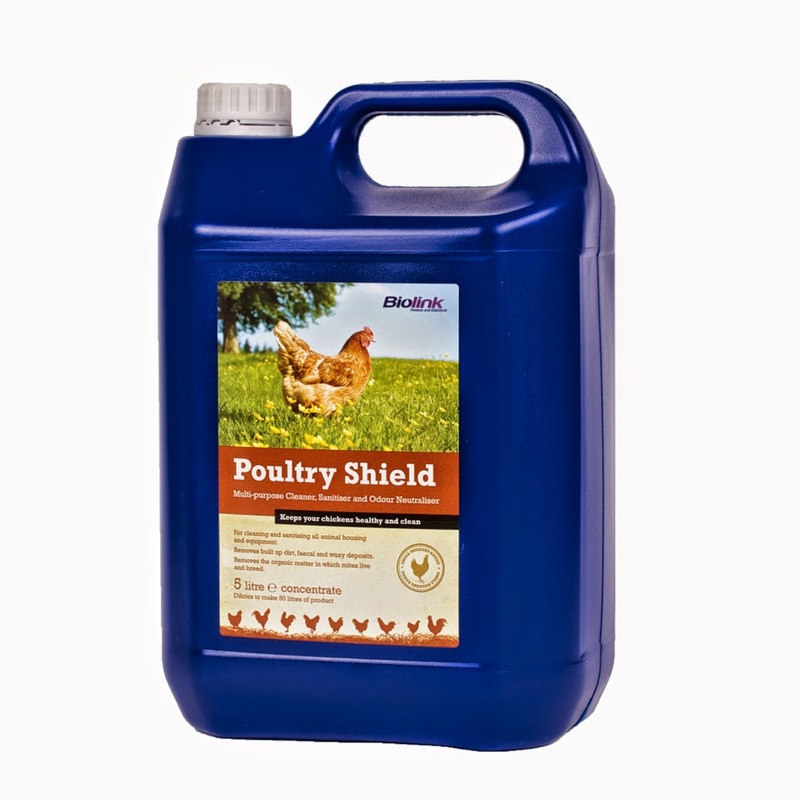 Poultry Shield is a multi purpose cleaner and sanitiser, widely recognised as the most powerful non-caustic cleaner on the market. When used liberally for cleaning inside the coop it will kill any red mite and remove any organic build up in the coop. Diatom is a 100% natural powder, which when used liberally inside the hen house will have residual red mite control, causing them to dehydrate as the microscopic shards cut their shells. It can equally be applied directly onto the birds for lice and even added to their feed for internal good health. Smite liquids and powders have a similar effect when used as part of a regular weekly clean. 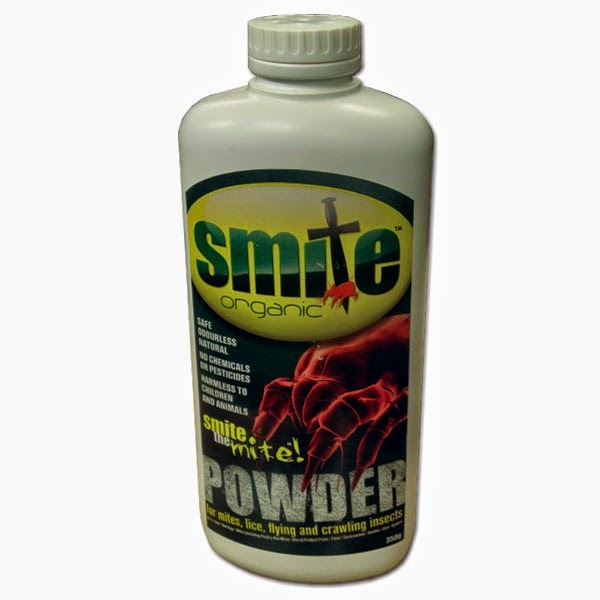 The Smite powder has the great addition of being able to be mixed with water and painted on the areas needing treatment, as it dries it once again becomes effective and kills mites that crawl through it. DE from Flyte so Fancy is also a natural diatomaceous powder that works by causing the red mites to dehydrate and die as they crawl through it. When applied liberally inside the coop, along perches and inside the nest box it acts as a great deterrent to red mite. As a 100% natural product it can also be applied directly to the bird to help prevent lice and fleas. Your girls are reluctant to go in to the coop at night. A good tip to see if you have red mite is to put some Vaseline on the ends of the perches. As the mites crawl through they will become stuck and you will be able to see them in the morning. Red mites are only red after they have fed and are filled with blood giving them their colour. They tend to feed at night so if you see little brown mites crawling around your hen house during the day, then they are more than likely to be red mite. The Net-Tex Total Mite Kill Range, coming in both ready to use and concentrated formulas, is a purpose made red mite killer brilliant for eradicating red mite as it contains Permethrin. When used within the house it will kill red mite, lice, fleas and also bacteria, fungi, etc. As the product contains permethrin it not only kills the red mite but has a fantastic residual effect for the coop. Equally handy for curing the plague of red mite are the Poultry Keeper Chicken House Fumers. An insecticidal fume generator for amateur use it will kill flying and crawling insects inside the coop. Easy to use, you merely place the fumer inside, close the house up tight making sure that all animals and chickens are away, then ignite. The fumer will smoke for thirty seconds to a minute. Leave the house shut up tight for around two hours then open all the doors and windows to allow the fumes to disperse. Follow this up with a general clean. The fumer contains permethrin and is highly effective as a red mite killer. Coming in a twin pack, this is ideal for repeat use within a short time to break the mites breeding cycle to clear out any remaining eggs or adults. Sometimes its possible that a swarm of red mite of biblical proportions might descend upon your hen house like a hoard of rampaging Visigoths. If that happens then it might be time to engage in chemical warfare to take the blighters down. 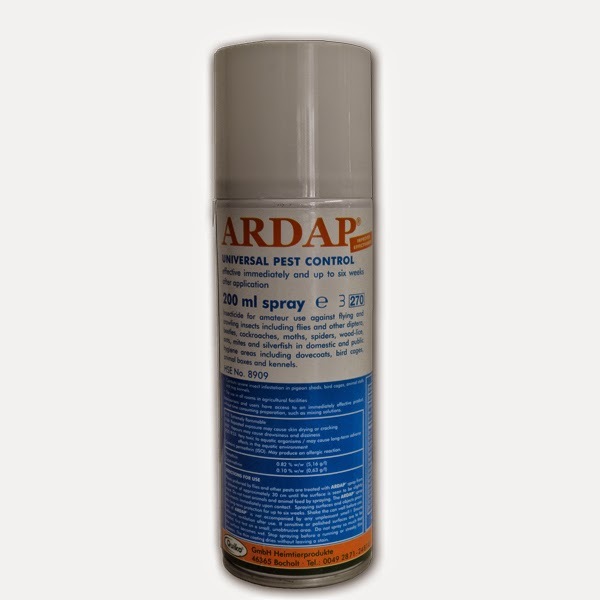 Ardap aerosol spray is an insecticide for amateur use, with immediate effect against crawling and flying insects, including red mite and with a residual action for up to six weeks. This should not be sprayed on to the birds nor near their feed and will effectively combat a severe infestation. An important note, this will kill all crawling insects, so do be careful not to harm the nice ones like bees and ladybugs. A final option and truly the last resort. We once had a customer tell us that they moved their hen house to find a mass of crawling, writhing, wriggling red mite underneath which then began to work its way across their field. If your infestation of red mite has reached this apocalyptic level of terror, then its is worth considering if it wouldn't just be best to start afresh. 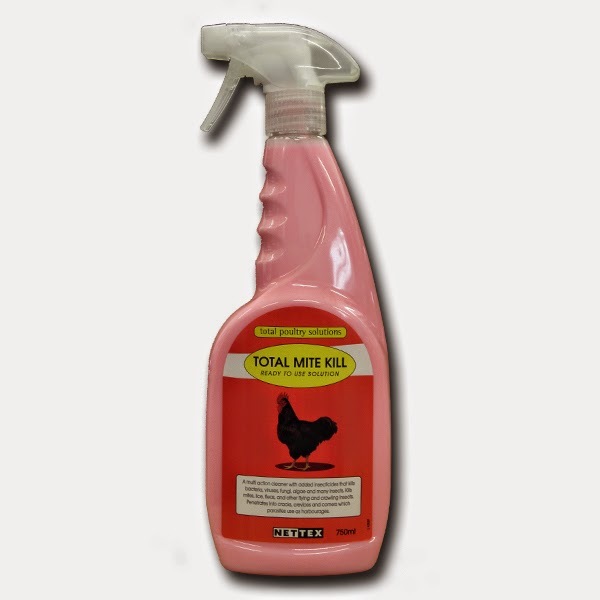 Red Mite is a continual pest for the poultry keeper and one which must be faced with constant vigilance and a cupboard well stocked with effective red mite killers and poultry disinfectants and cleaners. With an organised cleaning regime and the correct use of red mite products the problem can easily be solved. As always, if you have any questions you can always call us on 01300 345229 or email info@flytesofancy.co.uk or leave a comment on the blog below. This week, I have been spending my time down in the chicken field and out on the lawn taking new photo instructions for our ever popular Long Legged Maggie's Dozen Hen House. As such there is a guest blogger this week, none other than the overseer of the FSF Team, the hen at the top of the pecking order, the queen bee herself, Anne. While James is out enjoying himself in the sunshine and managing to find a seemingly endless supply of ice creams to eat while doing his work, I have been left with the job of writing this weeks blog. As I sat suffering writers block and knowing that James will pick up on any incorrect use of their, there and they're as quickly and smugly as possible, I answered the phone to have a long conversation with a lady who has just started keeping some hens in Wiltshire and was looking for a little advice. An idea for my blog entry soon followed, 6 Top Tips on Happy Chicken Keeping. When purchasing your hen house, you get what you pay for. Like most things, its a question of value for money. Everyone will be looking for different things, but ask questions like; Does this hen house have a practical and accessible layout? Will it be easy for me to clean? Is it constructed of quality materials, be it timber or plastic. Is the hen house sturdy and strong against the elements and most importantly is it fox proof? To keep your hens healthy and the chicken coop in its best condition, you should ideally be doing a thorough clean weekly. Make sure that you are changing the bedding weekly, this will avoid the house smelling, dampness and avoid infections. Use a purpose made hen house cleaner like Poultry Shield and/or a proper poultry disinfectant. The best way to avoid future issues is to stay on top of your cleaning regime. Prevention is better than cure. Feed your chickens on a staple diet of layers pellets and mixed corn. This is essential so they get the right balance of vitamins, proteins, etc. While its nice to see their faces light up, avoid giving them too many treats, they can quickly become fat, which can have repercussions on health and egg laying. Avoid feeding them scraps, especially dont feed them meat, dairy, cat food and fruits like pineapple or melon. One common cause of diarrhoea in hens is too many greens and scraps. 4. Fresh Air - Natures Medicine. Its good to have somewhere for the hens to shelter from the harsher elements, but make sure that your chicken run is generally light and airy. Sunlight is needed for egg production, so make sure your girls aren't shrouded in eternal half gloom. 5. Security - Safe as Houses. Make sure your chicken run is fox proof. Both urban and countryside fox numbers are on the rise. 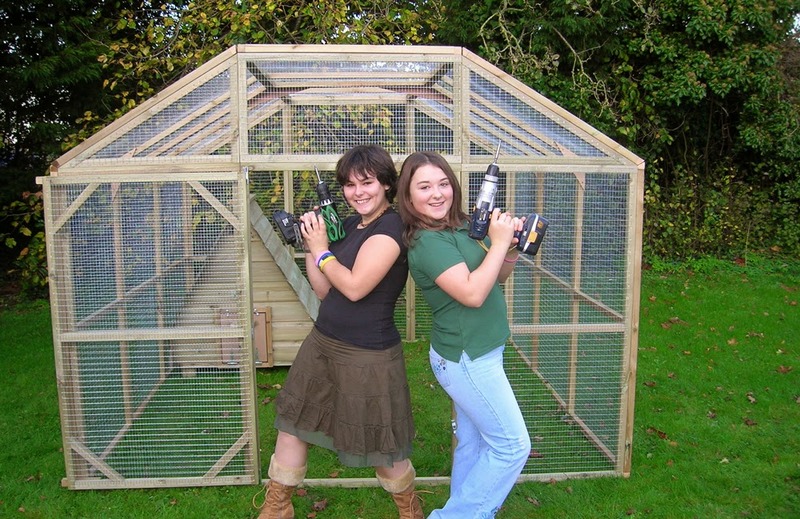 Have a chicken run that is made from a tough galvanised weldmesh, not chicken wire. Electric fencing is an effective barrier against foxes (and other predators) when used. No Dig Skirts can stop foxes tunneling into your hen house, while avoiding the appearance of a gulag. 6. Red Mite - The Pest of Pests. No matter if you have a perfect weekly cleaning regime, you must stay vigilant for red mite. Sooner or later everyone suffers from this pest but it can be eradicated if caught early. If you're worried you might have red mite in your chicken coop put some Vaseline on the end of the perches (or even something super sticky like fly paper). 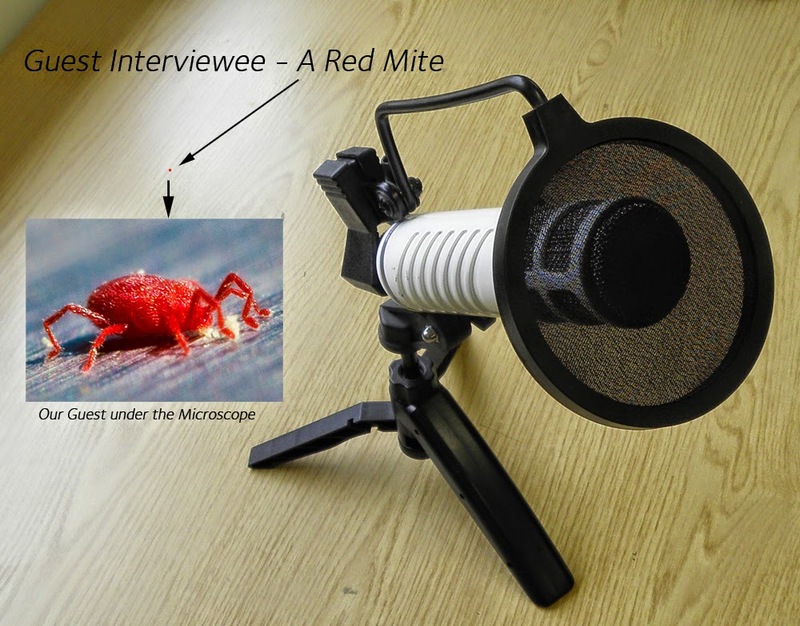 As the red mite crawl across they get stuck and you will be able to see them in the morning. If your chickens suddenly seem reluctant to go in their coop at night, you probably have a red mite issue. A red mite can go from egg to breeding adult in around seven days, so to break this cycle, clean your coop every five days to make sure you wipe them out. There are plenty of red mite eradication products like Diatom powder, but do make sure you keep using them to stay on top of the problem. So, these are my 6 Top Tips on Happy Chicken Keeping. Here at Flyte so Fancy we are always happy to talk if you have a query on our phone number 01300 345229 or via email on info@flyteosfancy.co.uk or by leaving a comment on the blog. James will be back with the blog next week, as I shall take advantage of the lovely Dorset weather for taking photos myself and make him sit inside instead. Wishing you Happy Hen Keeping! It was a bit of a surprise to all of us here at Flyte so Fancy HQ this Spring, to not only find our Bluebell Orpington sat tight on a clutch of duck eggs, a Cherry White snuggled down on her own nest of eggs in the corner of a hen house, a Cayuga protectively guarding her eggs in the Puddleduck Duck House by the pond and most interestingly a hen, rather ambitiously, sat on goose eggs. With the possibility of a whole gang of ducklings arriving at any moment, the workshop got cracking on a new floating duck house immediately. While myself, Rob the gardener and Operations Manager Rich headed down the to the Flyte so Fancy chicken field to pull the old floating island and duck houses in from the middle of the pond. Having got the old duck float out of the pond (my role as overseer and giver of "helpful" advise being met with derision and unkind words from the other two) we waited for the arrival of the new duck house, which arrived promptly and in splendid form. The result of the workshops labours, The Floating Duck Lodge. The timber float is packed with polystyrene so that it floats at just the right level for your ducks, although for some of the smaller breeds there is a helpful step. The hexagonal house is made from our high quality Scandinavian Redwood timber and will house six pairs of nesting ducks. With area on the float for whiling the day away, this really is a penthouse by the pool. Now, the boss Phill has always contended that a Flyte so Fancy float is so buoyant, that it can take the weight of two men and not sink. Once we had the new hexagonal float in the pond it wasn't long for the challenge to be accepted. Emptying his pockets of keys and with a little help, Operations Manager (and ex-professional rugby player) Rich was soon floating away happily on top of the pond. Quitting while we were ahead, and fearing that double black-belt chicken whisper Rob might be tempting fate, the duck housing was put into position on the float and the floating duck lodge was majestically pulled out into the middle of the pond. Where it now bobs away waiting for the ducklings, hopefully a few goslings too, to take their first swim. It'll be a little while yet till our ducklings take to the pond. As they were mostly raised by surrogate mother hens, we will have to wait for them to start preening their essential oils for floating through their own feathers before we can let them out onto the water. But i shall be sure to bring you many pictures of the ducklings first length of the pond. When I'm feeling particularly dramatic or busy, I like to portray myself to the rest of the office team, as the resident Sisyphus. The man condemned to push a boulder to the top of a hill each day only to have it roll to the bottom again. While poetical, I will however admit, that at the top of my list of jobs to do for quite some while now, are new photos for the Flyte so Fancy Poultry Protection Pen. Here at Flyte so Fancy, we continually update and re-do our instructions to make them as crystal clear and user friendly as possible. 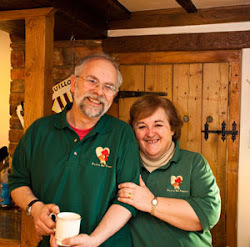 Anne often reminds me that when I tell customers that they can have a Long Legged Maggie's 12 Hen House together in twenty minutes with "a minute break for a cup of tea" that they haven't constructed three hundred of them, like I have. Our Poultry Protection Pens are also very simple to put together and built of the highest quality and strongest materials to keep your birds safe. 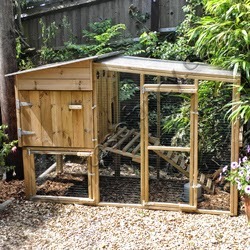 The Flyte so Fancy Poultry Protection Pen is a large walk-in chicken run keeps your hens secure. Starting at the smallest 9ft x 9ft and going up in jumps of 3ft, to the largest feasible, a 9ft by 24ft. Built from flat wired panels of pressure treated 38 x 38 timber, on to this is wired inch by half inch green plastic covered weldmesh, small enough to stop anything hopping in and strong enough to stop Mr Fox, or any other predator, from breaking in. These chicken runs have been designed so that once everything is screwed together and all the braces are in place, it is a sturdy and rigid unit to survive the harshest of conditions. Having a pen built like this, means you can let your girls out in the daytime with peace of mind, knowing that they are safe and secure from any of the dangers that lurk beyond the garden hedge. Also, if you work during the day and are particularly proud of your garden, you know that your girls can stretch their wings, whilst your herbaceous border remains in tact. To help keep danger away, the addition of a No Dig Skirt, to stop foxes and other predators tunneling in really makes the Protection Pen a poultry haven. Or, if you are setting up a permanent base of operations, getting the additional corresponding Sleeper and Woodchip pack, not only lifts the walk-in run up on a stately plinth (increasing the strength of the unit again) but creates a solid barrier to keep pesky predators out. Finally, to maximise the space inside your chicken run, there is the option of adding a mating panel. This allows your hen house to go on the outside of the pen, then connected by a joining tunnel, which gives the whole of the space left inside for some poultry perambulation. Equally, the addition of a polycarbonate roofing for your Protection Pen can help keep the worst of the elements off. The Flyte so Fancy Blog has looked in-depth at at the many advantages of polycarbonate roofing previously, and you can read that particular blog entry, Poultry Protection Pen Roofs, HERE. The Flyte so Fancy Poultry Protection Pen is a secure way to keep your hens safe, while you are out at work or throughout the day. These fox proof pens are one of our top sellers here at FSF HQ and while I still haven't got around to re-doing the instructions with yours truly (I've had a haircut specially for the occasion) these simple to build, sturdy and unobtrusive chicken runs will keep your girls protected and secure.